This Batshit Dog-Legged Jungle Runway Scares The Crap Out Of Me! 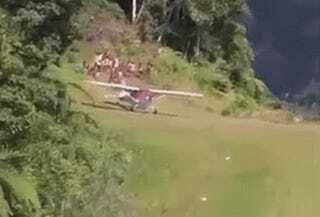 Bush flying is clearly not for the faint of heart, yet for some pilots it is just a job. Once in a while I will see an airstrip so terrifying that looks like it was drawn by a five year old and not an actual aircraft operating surface. The video below happens to be one of the cases. The pilots that do this type of thing on a daily basis are truly heroes.